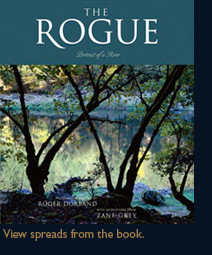 The Rogue, Portrait of a River, is a gorgeous coffee table book on Oregon’s famous Rogue River. Under the Wild and Scenic Rivers Act of 1968 the Rogue became one of the first eight rivers in the nation to have sections of their waters awarded protection based on possessing outstanding scenic and recreational value. Long before this official designation the Rogue elicited passionate devotion from those fortunate enough to be living along its shores. The Native Americans who took their lives from the river fought nearly to extinction to remain in their homeland. From their time through the present, when we find descendants of the original settlers still living along the Rogue, the majesty and charm of this exceptional river has maintained a hold on the human heart. In The Rogue, Portrait of a River, a native son of the region, photographer Roger Dorband, takes us on a journey of discovery from the headwaters of the Rogue down to the Pacific. Bursting from a high mountainside, we follow as its pristine water tumbles out of the Cascade mountains, careening over Rough Rider Falls and gaining momentum as it flows into the beautiful Rogue Valley. Where the river enters the Klamath Mountains we marvel at Hellgate and Mule Creek Canyons, thrill at the spectacle of the river’s tumultuous rapids, then begin the long slide along the meandering Rogue as it wends its way to the sea. An impassioned foreword by Governor John Kitzhaber introduces Dorband’s personal and informative text and his stunning photographs, which are accopmpanied by poignant quotations from Zane Grey, in sum providing an intimate ecounter with this marvelous river. Books ordered through Raven Studios are autographed copies. Pay by check using our convenient order form (PDF format) -or- use PayPal™ and order directly through our site order page; either way, shipping is free in the USA. Email us with any questions.